The second of two assassination attempts on U.S. President Harry S. Truman occurred on November 1, 1950. It was carried out by militant Puerto Rican pro-independence activists Oscar Collazo and Griselio Torresola while the President resided at Blair House during the renovation of the White House. Both men were stopped before gaining entry to the house. Torresola mortally wounded White House Police officer Leslie Coffelt, who killed him in return fire. Secret Service agents wounded Collazo. President Harry S. Truman was upstairs in the house and not harmed. In the 1940s, the Nationalist Party of Puerto Rico had little political power in the country, where voters had elected the Popular Democratic Party of Puerto Rico (PPD) as the majority in the legislature. Nationalists believed that Puerto Rico suffered under American colonialism and wanted independence. The Popular Democratic Party of Puerto Rico (PPD) was supporting negotiations with the United States to create a "new" political status for the island. The Puerto Rican Nationalist Party Revolts of the 1950s were an armed protest for independence from United States Government rule over Puerto Rico. The Party repudiated the "Free Associated State" (Estado Libre Asociado) status that had been enacted in 1950, as the Nationalists considered it to be a continuation of colonialism. The revolts began on October 30, 1950, upon the orders of Pedro Albizu Campos, president of the Nationalist Party. Uprisings occurred in Peñuelas, Mayagüez, Naranjito, Arecibo and Ponce. The most notable uprisings occurred in Utuado, Jayuya, and San Juan. These were suppressed by strong military force, including the use of planes. In New York City, Nationalists Griselio Torresola and Oscar Collazo developed a plan to assassinate President Harry S. Truman in order to raise awareness of the drive for independence. They wanted to show that the October 30 uprising had not been an "incident between Puerto Ricans" as described by President Truman, but was an act of rebellion and war between two countries. 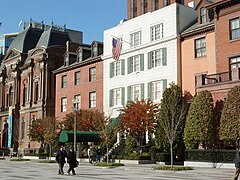 They had learned that Truman was living at the Blair House, while the White House was renovated. The two men realized that their attempt was near-suicidal, and that they likely would be killed. They wanted to bring world attention to the government killings of rebels and associates in Puerto Rico, and the drive for independence. Torresola, a skilled gunman, taught Collazo how to load and handle the guns they would use, as his experience had been with other types. They took the train from New York to Washington, DC to reconnoiter the area. On November 1, 1950, they moved into action. Blair House, site of the attempt, shown here circa 2006. At the time of the attempt, there were two guard booths in front, which are not present in this image. Torresola approached Blair House, located on Pennsylvania Avenue, from the west side, while Collazo walked up behind Capitol police officer, Donald Birdzell, who was standing on the steps of the Blair House. President Truman was napping in his quarters on the second floor. Collazo tried to shoot Birdzell in the back, but had failed to chamber a round in his pistol, and the gun did not fire. Collazo chambered a round and fired the weapon just as Birdzell was turning to face him, and shot the officer in his right knee. After hearing the gunshots, Secret Service agent Vincent Mroz ran through a basement corridor, stepping out of a street-level door on the east side of the House, where he opened fire on Collazo. Mroz stopped Collazo with a bullet to the chest while he was on the entrance steps. Two other officers also shot Collazo, in what was described as "the biggest gunfight in Secret Service history." Meanwhile, Torresola had approached a guard booth at the west corner, where he took White House Police officer Leslie Coffelt by surprise, shooting four times at close range and mortally wounding him with a 9×19mm German Luger. Three of those shots struck Coffelt in the chest and abdomen; the fourth went through his tunic. Torresola shot police officer Joseph Downs in the hip, before he could draw his weapon. As Downs turned toward the house, Torresola shot him in the back and in the neck. Downs got into the basement and secured the door, denying the attacker entry into the Blair House. Torresola moved to the shoot-out between his partner Collazo and several other police officers, shooting officer Donald Birdzell in the left knee. Birdzell could no longer stand and was effectively incapacitated, although he would later recover. Torresola was standing to the left of the Blair House steps to reload when President Truman looked outside his second floor window, 31 feet (9.4 m) from the attacker. Secret Service agents shouted at Truman to get away from the window. At that same moment, Coffelt left the guard booth, propped against it, and fired his .38-caliber service revolver at Torresola, about 30 feet (10 m) away. Coffelt hit Torresola 2 inches (50 mm) above the ear, killing him instantly. Coffelt limped back to the booth and blacked out. Taken to the hospital, Coffelt died four hours later. The gunfight involving Torresola lasted approximately 20 seconds, while the gunfight with Collazo lasted approximately 38.5 seconds. Only one of Collazo's shots hit anyone, largely because Collazo was not a skilled or experienced gunman. Torresola, an expert shooter, did most of the shooting and inflicted almost all of the injuries on the Secret Service officers. President Truman and the Secretary of State Dean Acheson asked Coffelt's widow, Cressie E. Coffelt, to go to Puerto Rico, where she received condolences from various Puerto Rican leaders and crowds. Mrs. Coffelt responded with a speech absolving the island's people of blame for the acts of Collazo and Torresola. Oscar Collazo was convicted in federal court and sentenced to death, which Truman commuted to a life sentence. While in prison, he gave an interview telling of his long devotion to the Nationalist Party and cause of Puerto Rican independence. When he was a young man in 1932, he heard Pedro Albizu Campos give a speech about American imperialism, saying that American research doctor Cornelius P. Rhoads had written an outrageous letter appearing to brag about killing Puerto Ricans in experiments. In 1979, President Jimmy Carter commuted the sentence of Collazo to the time served, and the former revolutionary was released. He returned to live in Puerto Rico, where he died in 1994. At the time of the assassination attempt, the FBI arrested Collazo's wife, Rosa, on suspicion of having conspired with her husband in the plan. She spent eight months in federal prison but did not go to trial. Upon her release, Rosa continued to work with the Nationalist Party. She helped gather 100,000 signatures in an effort to save her husband from execution. Acknowledging the importance of the question of Puerto Rico's status, Truman supported a plebiscite in Puerto Rico in 1952 on the new constitution to determine its relationship to the U.S. The people voted 81.9% in favor of continuing as a Free Associated State, as established in 1950. Inside the Blair House, a plaque was installed to commemorate White House Police officer Leslie Coffelt. The day room for the U.S. Secret Service's Uniformed Division at the Blair House is named for Coffelt as well. ^ Glass, Andrew (November 1, 2017). "Puerto Rican militants try to assassinate Truman, Nov. 1, 1950". Politico. Retrieved April 16, 2019. ^ "FAQ: Assassination Attempt on President Truman's Life". Harry S. Truman Presidential Library & Museum (Independence, Missouri). Retrieved April 16, 2019. ^ Ayoob, Massad (2006). "Drama at Blair House: the attempted assassination of Harry Truman". American Handgunner (March–April 2006). Retrieved April 1, 2010. ^ "Nylatinojournal.com". Archived from the original on August 26, 2009. Retrieved April 25, 2016. ^ a b Miñi Seijo Bruno; La Insurrección Nacionalista en Puerto Rico, pp. 206-215; Editorial Edil pub., 1989; ISBN 968-6308-22-9 pp. ^ a b c d e f g "pr-secretfiles.net" (PDF). Retrieved April 25, 2016. ^ Excerpts from the history of the United States Secret Service, 1865-1975. Department of the Treasury, United States Secret Service. 1978. p. 30. ^ Stephen Hunter and John Bainbridge Jr. (October 9, 2005). "American Gunfight; A little-remembered shootout near Lafayette Square left President Harry Truman's life hanging in the balance". The Washington Post. p. W.16. ^ Tom (May 2, 2012). "Dramatic Attempt to Assassinate President Truman in Blair House". Ghosts of DC. Retrieved March 3, 2019. ^ a b Jonah Raskin, Oscar Collazo: Portrait of a Puerto Rican Patriot (New York: New York Committee to Free the Puerto Rican Nationalist Prisoners, 1978). ^ Hunter, Stephen; Bainbridge, Jr., John (2005). American Gunfight: The Plot To Kill Harry Truman – And The Shoot-Out That Stopped It. New York: Simon & Schuster. pp. 4, 251. ISBN 978-0-7432-6068-8. Nelson Antonio Denis, War Against All Puerto Ricans: Revolution and Terror in America’s Colony, Nation Books (April 7, 2015); ISBN 978-1568585017.